A trading term called a dead cat bounce is used to when a stock is in a severe decline and has a sharp bounce off the lows. It occurs due to the huge amount of short interest in the market. Once the supply and demand has become unbalanced, any type of bear market rally will create a massive short covering which will lead to a swift price move up. This bounce will be short lived and followed up by heavy selling which will break the prior price low. A trader will use a bottom-up approach when choosing the best candidate for taking a long position, since the investor will be quite intimate with the company’s financials and management structure. The origin of the dead cat bounce phrase comes from the East. The first time this phrase occurred was in 1985 when the Singaporean and Malaysian markets bounced after a very strong bear market declined. A journalist Christopher Sherwell of the Financial Times reported that a stock broker referenced the rally as a “dead cat bounce”. You’ll need to be a seasoned trader to trade a dead cat bounce. The initial challenge is the stock is often a falling knife, so determining where to pick up some shares is to some extent a gamble. The best approach is to hold off until there is an explosive move in volume, followed by a candlestick reversal pattern. Then take the long position, do not get crazy. Be ready to sell out on the first indication of weakness as the up move will be short lived. See the chart below of Fannie Mae from late 2007 through mid-2008. 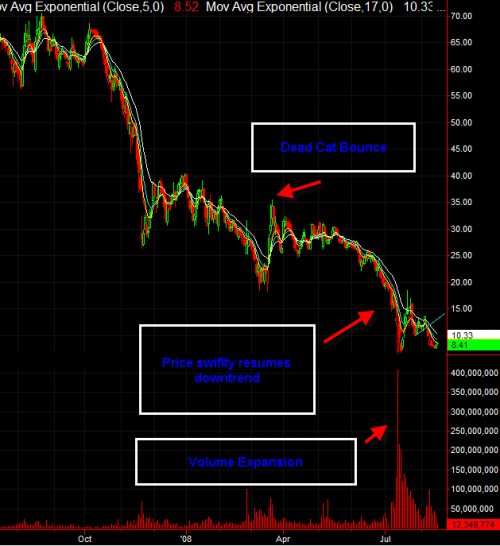 Take note how there was a dead cat bounce up to $35, prior to the sharp sell off below $10.